- four photographically set and permanently imprinted natural Marble Coasters. The four marble coasters are imprinted with the "On Lake Time" image, each featuring the unique character of the marble used, are backed with cork to prevent slippage and measure a generous 4 x 4". 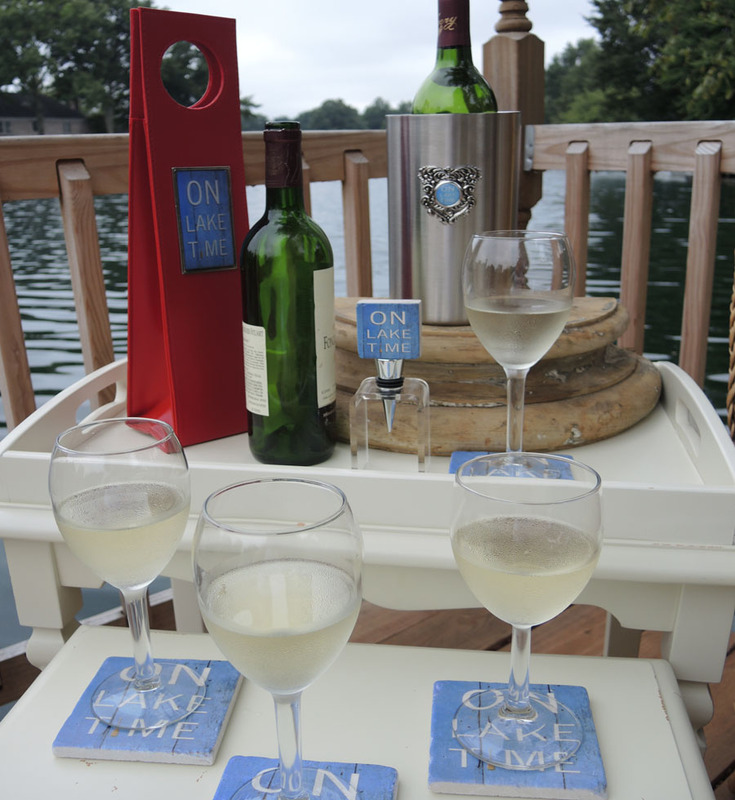 - one photographically set and permanently imprinted "On Lake Time" marble top Wine Stopper. This same imported marble tops the wine stopper, plated in chrome with multiple suction rings creating a good seal. Stopper measures 5.75"x 3.25". - one faux leather, fully lined re-usable Wine Carrier decorated with a pewter label, with the "On Lake Time" photographic image enameled in the setting . The Wine Carrier measures 3.5" x 15", hold one bottle of wine and fold for easy storage. - a double insulated brushed stainless steel Wine Cooler, embellished with antique reproduction filigree and hand enameled "On On Lake Time" center.The Wine Cooler measures 4.5" x 7.75" and holds one bottle. Wine and glassware not included. Ships common carrier. Eligible for return or exchange with 25% restocking fee. Please view our return policy for more information.